In other worlds, only skinny euros under 45 avoid screening. I should be under 100, typically under 90, so that’s not a good number. It’s in the “pre-diabetes” range, and the current enthusiasm is to start treatment with meds in the hope of delaying the onset of “true” diabetes. Of course there’s also the theoretical benefit of weight loss and exercise, but few people manage that. Unfortunately we know weight loss programs rarely work, and the reports of med efficacy smell dubious to me, so it’s not entirely clear how useful the “pre-diabetes” diagnosis really is. The diagnosis, of course, is likely to raise one’s health insurance costs, though ObamaCare helps somewhat. Since I’m already a skinny fitness nut my family doc wanted to completely ignore this, presumably on the grounds that there’s nothing useful to do about it. A wise recommendation, but I’m not built that way. Poking around the net I found a BMJ article on a statistical model that tries to put some personalized precision medicine context around that fasting glucose. The researchers settled on 7 factors  that seemed to predict 3 year conversion to diabetes (yeah, only 3 year range). 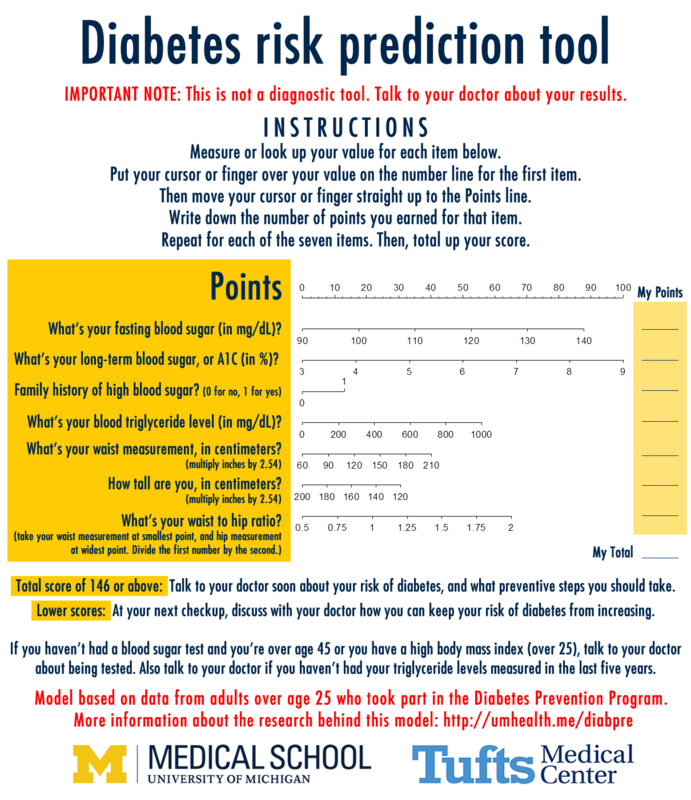 So I ran the Diabetes risk prediction tool on myself. I got 91 points; the instrument recommends consideration of preventive steps for scores of 146 and up. Which vindicates my FP’s intuition (maybe she does the instrument in her head?). I’m guessing my odds are probably in the 25-30% range over 3 years. So pretty high over 10 years, but the bottom line is that there’s really not enough data to justify taking an (invariably) icky medicine. The HbA1c (glycosylated Hb) value is weird in this study. Normal HbA1c is usually given as 4.0-5.9%, but in this study anything above 4 starts to pile on bad points. This could be either a sign that there’s something funky with their model, or a sign that we should redefine the normal range for HbA1c (I’m 5.2, “normal”, but on their chart it lines up with a fasting glucose of about 105). Lastly, the paper text says “baseline fasting glucose was by far the most important predictor” which does make me wonder if the other 6 factors mean anything. I do idly wonder about getting a TSH (thyroid stimulating hormone). Type 2 DM in young 5/2012: Makes me suspect something odd is going on. Medicine 2020: Integrative Personal Omics (iPOP) identifies RSV triggered onset of Type II Diabetes 3/2012. “… The initial sequencing of his genome had also showed that he had an increased risk for type 2 diabetes … later became infected with respiratory syncytial virus, and his group saw that a sharp rise in glucose levels followed almost immediately... “. I wonder if I developed a similar infection between 2011 and 2012.